This December marks my second holiday season writing this blog. Looking back over 2009, it’s very clearly been a year of bounty and blossoming for me. Many of you reading this blog post were attendees at my first lectures and workshops. I met others of you during my presentation at the Science and Nonduality Conference in San Rafael, CA. And some of you discovered this blog solely over the internet, querying Google with unlikely combinations of religion/science terms and finding me! All year, I’ve been honored and touched by your thoughtful participation and enthusiastic support. Thank you! Many of us love latkes, but few of us realize their spiritual implications. The process of frying can be a metaphor for redemption. When we heat oil, its molecules accelerate, raising its vibrational energy. While frying, excess water and impurities from our latkes purge into the oil. The resulting cake is crisp and clean. Imagine the heated oil as God, and a latke as you. Surrender yourself to frying, immersing yourself in a higher vibrational energy, and feel your tears and vices be absorbed and absolved. You’ll emerge from the pan purified. Happy Holidays! Peace and blessings to you. Great! Have a wonderful Holiday and a Healthy and Peaceful New Year. You, too, Renee, and thank you so much! You know I am not Jewish but I have a special place in my heart for Judaism and Jewish men frankly. I really like that Judaism is into working through these conflicts. It seems that the frying and washing away of impurities is supported intellectually at least. Are laktes like potato pancakes because I’ve had those, they are german and often have apple sauce or sour cream on them . So I will surrender to the frying. It’s part of growing and it’s good and nice to know we can support each other in our efforts to grow. Thank you for your compliments about Judaism! 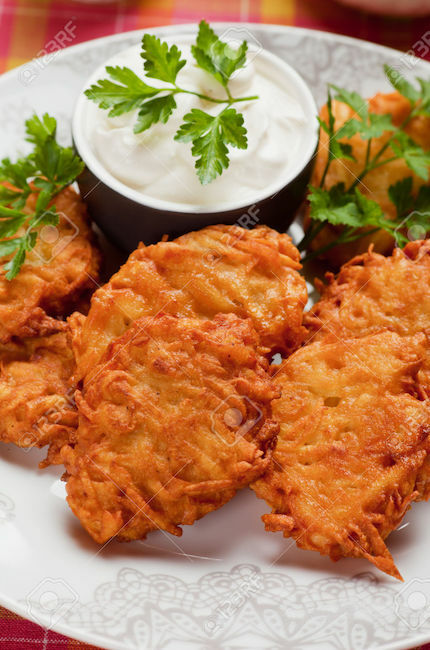 Latkes are, indeed, the same as German potato pancakes. They’re an Eastern European tradition, incorporated into the Jewish holiday. Wishing you deep spiritual frying this holiday season, and looking forward to more connection and adventures in this coming year!